Agumbe (Kannada: ಆಗುಂಬೆ) is a village located in the Shimoga district in the state of Karnataka, India. Lying in the Thirthahalli taluk and the Malnad region, Agumbe is among the places in India that receive very heavy rainfall earning it the sobriquet, “Cherrapunji of the South”. 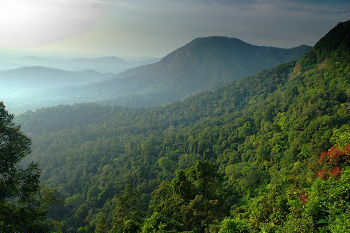 It is also the home of the Agumbe Rainforest Research Station, the only permanent rainforest research station in India. The renowned herpetologist, Romulus Whitaker called Agumbe the capital of King Cobra. An area near Agumbe has been converted into a protected area for Medicinal Plants to help in their conservation. Many new species of flora and fauna are found in this region. This is an ideal place to enjoy your evening, but mostly crowded in the evening time, as everyone comes here especially during weekends. There is a view point from where you can see the sunset, this is considered to be the one of the most beautiful sunset in Karnataka. Trekking starts from a place called Someshwara which is a small town you reach just after getting down from Agumbe Ghats. Kunchikal Falls: is the highest waterfall in India, and ranks 116th in the list of highest waterfalls in the world. Its total height is 1493 ft/455 mts. It is formed by the Varahi river. Barkana Falls: is the 10th highest waterfall in India with a height of 850 ft/259 mts. It is formed by the Seeta River. Jogigundi: This is a small water fall which is very near to Agumbe, it takes about 10 to 15 min to reach this place. Koodlu theertha falls: A beautiful waterfall just 20 km from Agumbe, includes a Trek of 3–4 km and you will reach the most beautiful falls in the entire state. Agumbe is near the town of Thirthahalli which lies on the National Highway NH-13. From the state capital of Bangalore, Agumbe can be reached by taking NH-4 till Tumkur, then NH-206 till Shimoga and then NH-13 to Thirthahalli (a total distance of about 380 km.). Udupi on the Konkan Railway is the nearest railway station. The nearest airport is the Mangalore International Airport.. Agumbe is about 100KM from Mangalore. Travel Plus conducted many tours to Agumbe for their visitors. Please call Travel Plus at +91-9972722878 to arrange trip to Agumbe and nearby places. We can pick you from Mangalore, Udupi Railway station or from Mangalore airport or any of your designated places. It can also be reached from Bangalore via Hassan -> Chikkamagalore ->Balehonnur -> Jaipura -> Sringeri -> Agumbe. As of today, this is the best route to reach Agumbe. In this route you will be crossing the best possible hilly regions of the western ghats. And this being the shortest route. If you are interested to cover another tourist destination , you can choose a route from Bangalore via Hassan -> Belur -> Chikkamagaloor ->Sringeri-> Agumbe. There are private buses plying from Mangalore to Shimoga via Udupi, Hebri and Agumbe at regular intervals. The approximate time taken from Mangalore to reach Agumbe is three and half hours. Agumbe receives the second highest annual rainfall in India, next only to Cherrapunji (or the nearby Mawsynram).It receives a mean annual rainfall of 7,640 millimetres (301 in). The absolute maximum rainfall recorded in Agumbe in a single month is 4,508 millimetres (177.5 in) in August 1946. Please call Travel Plus at +91-9972722878 to arrange trip to Agumbe and nearby places. We can pick you from Mangalore or Udupi Railway station or from Mangalore airport or any of your designated places. This entry was posted in Holidays, Karnataka, Trekking, Waterfalls. Bookmark the permalink.